As Hong Kong Marks Handover Anniversary, A Push And Pull With China Over Identity : Parallels There's anxiety in Hong Kong over things appearing from mainland China. But the continued presence of things not found on the mainland shows there's still a gap between this and other Chinese cities. Pro-democracy activists hang a black cloth with a message demanding universal suffrage and the release of jailed Chinese Nobel Peace laureate Liu Xiaobo on the Golden Bauhinia flower statue in Hong Kong. 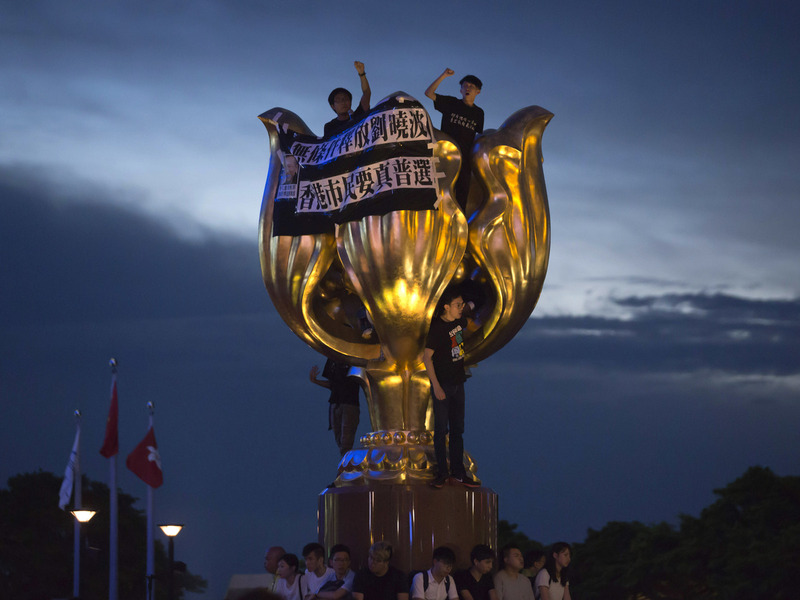 On Monday, they had obscured the statue — a gift from Beijing to Hong Kong — with black cloth. On Monday, a group of protesters in Hong Kong did something unusual. They slipped by security guards to climb on a large gilded statue and wrapped it in black cloth. Their target was an object associated with state power: the Golden Bauhinia statue, a floral sculpture more than 15 feet high that Beijing gave to Hong Kong, a symbol of the city's 1997 transformation from a British crown colony into a special administrative region of the People's Republic of China. A shiny and alien-looking presence near the Hong Kong convention center, it is a landmark that mainland Chinese tourists love to visit, but is mostly ignored by Hong Kong residents. The protesters, including activist Joshua Wong, a leader of Hong Kong's pro-democracy Umbrella Movement, managed to obscure the statue from view. What makes this unusual is authorities – not protesters – are usually the ones to make people or things disappear. Warned that security forces would be working overtime to stop crowds and banners from appearing on July 1, the 20th anniversary of Britain's handover of Hong Kong to China, the protesters decided to turn the tables by making this official object disappear – if only briefly. Two days later, when they climbed on the statue and held a conventional sit-in – "occupying" the statue – the police whisked the protesters out of sight and into jail. But making the statue disappear, even temporarily, was a symbolically powerful act. Every day, a ritual raising and lowering of the PRC flag takes place nearby, and the statue is slated to figure in Saturday's special ceremonies over which Chinese President Xi Jinping will officiate. It's Xi's first visit to Hong Kong since he became president in 2013 and assumed control of the Communist Party the year before. Thinking about these events, we're struck by how much of the recent history of Hong Kong – and of mainland China, too – can be seen as a series of struggles over appearance and disappearance. Consider, for example, the biggest news story out of Beijing on Monday, the same day Hong Kong's golden statue was disappearing: the partial reappearance of jailed Chinese Nobel Peace laureate Liu Xiaobo. After nine years behind bars, he was taken to a hospital in Shenyang, in Liaoning Province, terminally ill. He'd been thrown in prison for his role in drafting Charter 08, a call to the Chinese Communist Party to live up to the promises made in the PRC's own constitution. When Joshua Wong and his fellow protesters occupied Hong Kong's golden statue, they held up a banner calling for Liu's complete release. Anxiety in Hong Kong is often linked to the creeping appearance of things that once were associated primarily, or exclusively, with the mainland. These include the growing use of Mandarin where Cantonese once ruled, the banners and billboards with government propaganda and bank ads touting Beijing's "One Belt, One Road" political and economic initiative and the presence of People's Liberation Army troops in the city's military barracks. At the same time, the continued presence in Hong Kong of what doesn't – and can't – appear on the mainland shows there's still a gap (if no longer a chasm) between this and other Chinese cities. 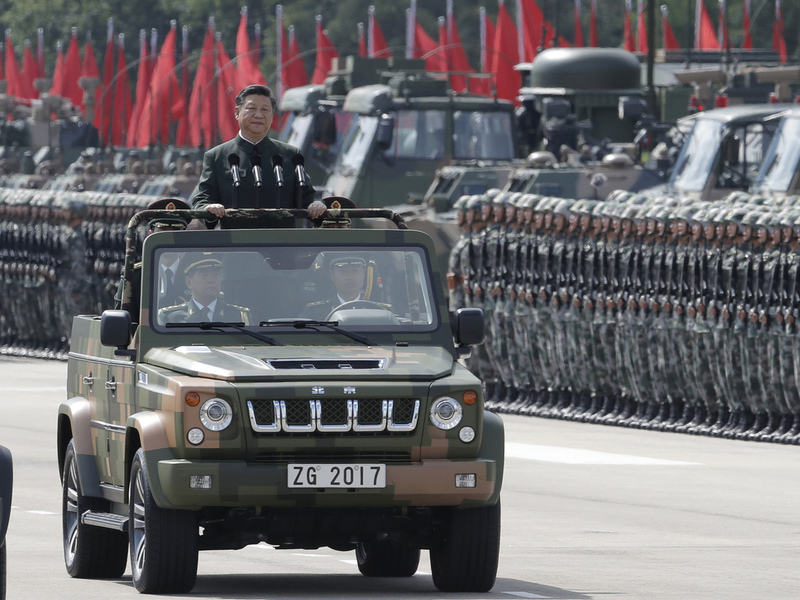 Chinese President Xi Jinping inspects Chinese troops of the People's Liberation Army in Hong Kong on Friday. Xi landed in Hong Kong Thursday to mark the 20th anniversary of Beijing taking control of the former British colony. Only in Hong Kong can crowds gather to commemorate the anniversary of the June 4 massacre that took place near Tiananmen Square in 1989 without being jailed. Replicas of the "Goddess of Democracy" statue, a regular feature of these commemorations, have never appeared in Beijing since 1989. And only in Hong Kong bookstores can one find writings by and in praise of taboo figures like the Dalai Lama and Liu Xiaobo, the jailed Nobel laureate. The same goes for books that present Xi and other top Communist Party leaders in a negative light, whether they be carefully argued scholarly works or lurid, gossipy biographies. Recently, however, independent bookstores that stock such works have been disappearing — replaced by others with ties to the mainland. And five Hong Kong booksellers have also disappeared. Movies, too, have been disappearing from theaters, even at the height of their popularity – a case in point, the 2015 film Ten Years, which presented a dystopian vision of Hong Kong a decade down the line as a city where neither the local language nor locally produced food items were allowed to exist. Off Lantau island, where Hong Kong's international airport is located, the appearance of a new, disruptive landmark is also causing anxiety – the soon-to-be longest bridge in the world. The Hong Kong-Macao-Zhuhai Bridge will link Hong Kong more tightly than ever to the mainland, suggesting that a complete convergence between China and Hong Kong could happen well ahead of 2047, the end of the 50-year grace period during which Hong Kong was supposedly to have "no change." The bridge, too, has helped cause a literal disappearance — of the endangered pink dolphins that used to swim in the Pearl River estuary it spans. Due to heavy dredging and construction work, these rare animals, a symbol of Hong Kong at the time of the 1997 handover, have almost completely vanished. Late this week, the authorities were busy scrubbing away graffiti that painted what happened 20 year ago as the start of a new kind of colonial period — not a moment of liberation, as the Chinese government prefers to spin it. Those who scrawled the slogans are disappearing into detention—even as some of this week's statue occupiers reappear on the streets and hope to take part in new protests. Meanwhile, the biggest appearance of all in Hong Kong this week has been the arrival of Xi Jinping. He landed Thursday from Beijing to preside over Saturday's handover anniversary rituals, when a Chinese aircraft carrier will make its debut in Hong Kong harbor — another marker of Beijing's assertion of control over the territory. When this particular push and pull is over, other struggles between appearance and disappearance in Hong Kong will continue. But the fear in Hong Kong now is that the things that have been lost will never be coming back. Ilaria Maria Sala is a Hong Kong-based writer who has contributed to publications including Quartz, ChinaFile and The Guardian. Jeffrey Wasserstrom is a professor of Chinese history at the University of California Irvine and editor of the Oxford Illustrated History of Modern China.